We are located at 6213 Lower Frontage Road in Cass Lake, Minnesota. Our neighbors include Teal's Market and Safari Liquior. Nestled in North Central Minnesota at the junction of highway 2 and 371, we are 0.5 miles from Cass Lake public access and 1 mile from Pike Bay winter access. We are about 20 miles West of Lake Winnie and 15 miles North of Leech Lake. 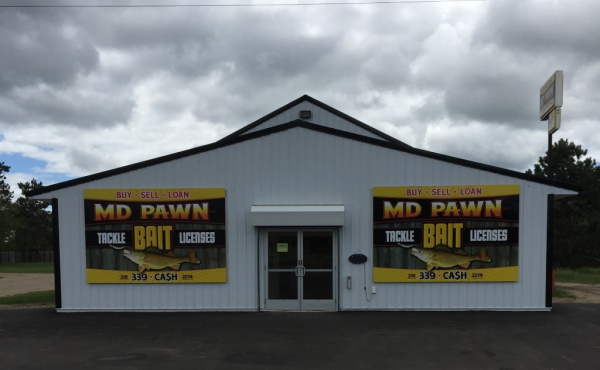 We are both a pawn and bait store offering a wide variety of products in our store. Our bait department includes sporting licenses, live bait, tackle, fishing and hunting gear, and other sporting necessities. We also have an array of video games, dvds, gaming consoles, guns, augers, portable fish houses, and jewlery. Inventory changes daily so stop in to see our selection of new products!